As the very word “screening” denotes, the health screening forms and are official documents that are used in hospitals and other health organisations to state the condition of a patient and record his progress. The Health Forms although of myriad types, usually have a standard format that is accepted universally. Now if you have been entrusted with the task of drawing up medical screening forms, you could use these well-designed templates to do so. 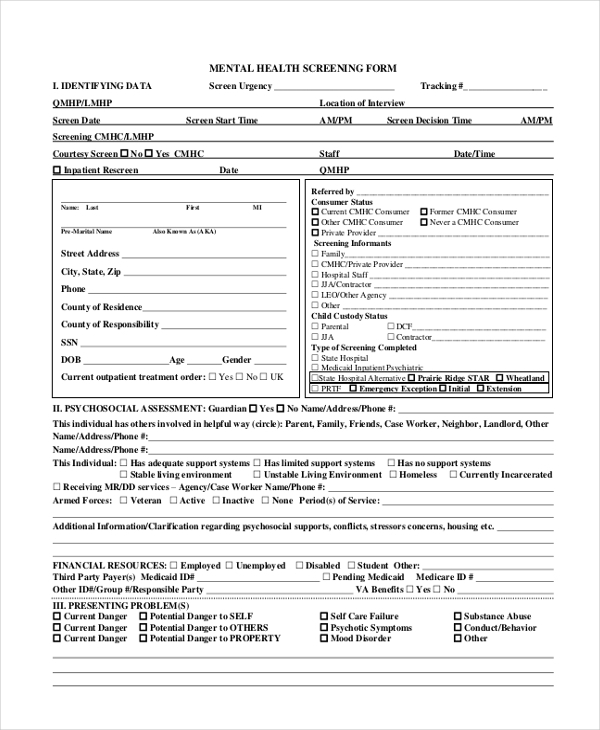 This mental health screening form may be used by psychiatrists and psychologists or mental health institutions. The template comes in a PDF format and would serve as a splendid sample. This is an example of a basic health questionnaire form. It comes in a word format; that allows you to make changes or even edit some basic details as provided in the form. You can add or remove pointers as well. To keep a tab on the fitness quotient of a patient, this fitness health screening form may be used. It comes in a PDF format and presents the format in a neat, well designed and formal manner. 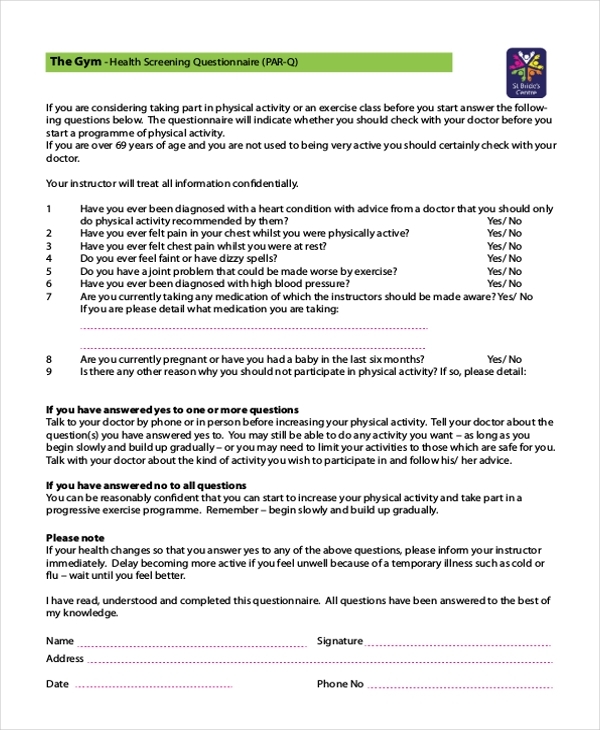 This fitness health screening form may be used by gyms and other such organisations. It comes in a PDF format and is print ready. It also contains all the details that such a form should have. Screening forms are maintained for biometric purposes. These are official documents and that is why this PDF form would come in handy. This form template comes with a neat and organised layout. A consent form is a must while treating patients. Patients need to go through the health consent form before following any course of treatment. For such a form, you may use this form template. 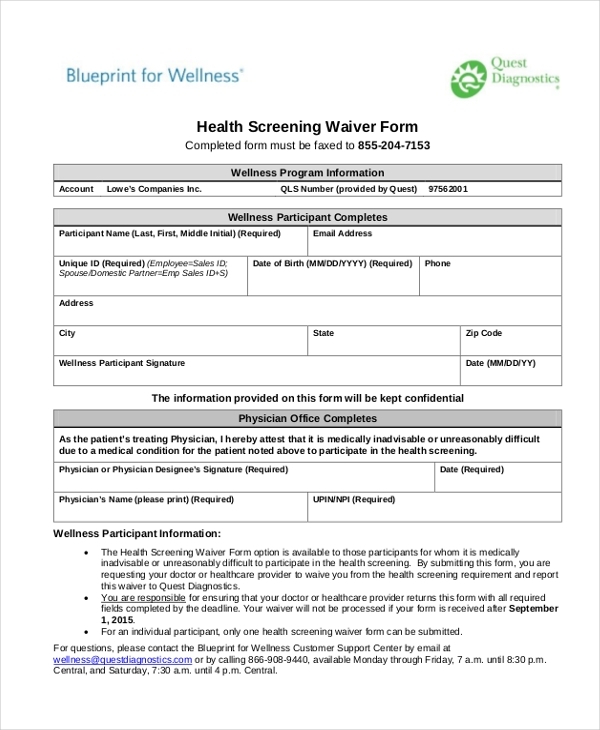 This isn’t a plain health screening form but actually, comes in the form of a waiver. To create such a document, you can take the help of this form template which comes in a PDF format. 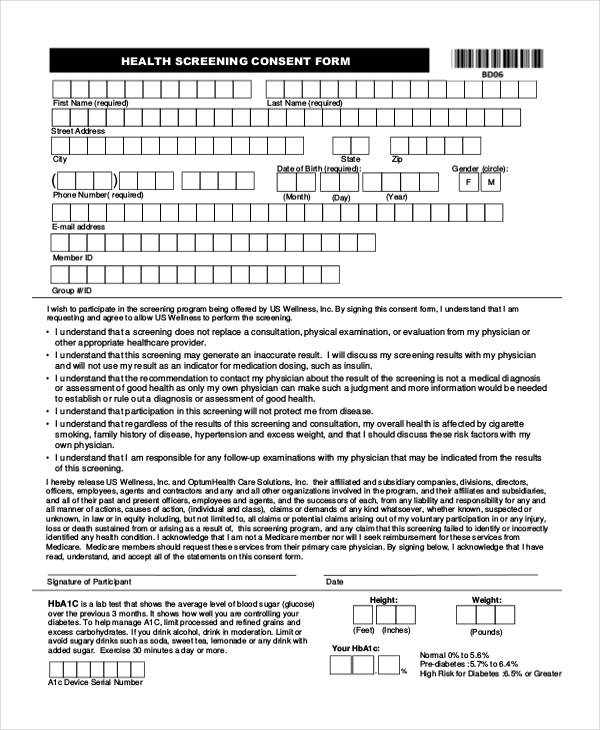 This health screening form may be used by doctors and physicians. 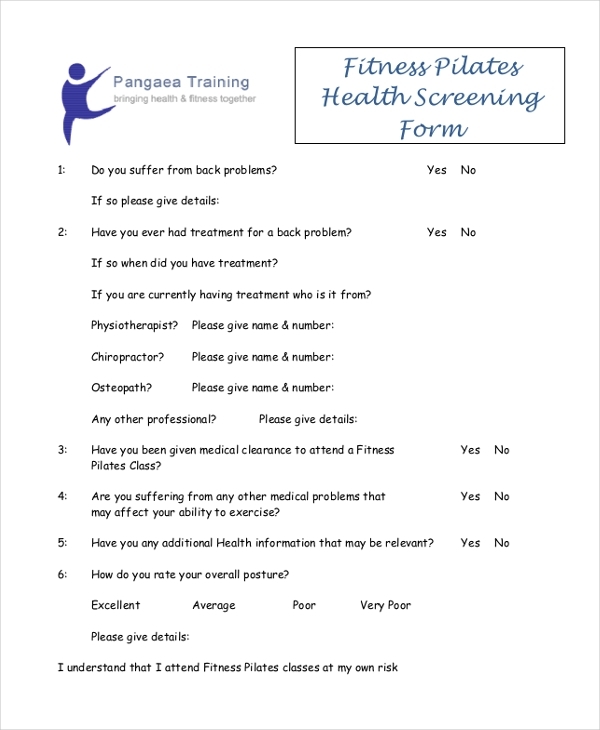 They can use this PDF form to keep a track of their patients’ health and their course of treatment as well. 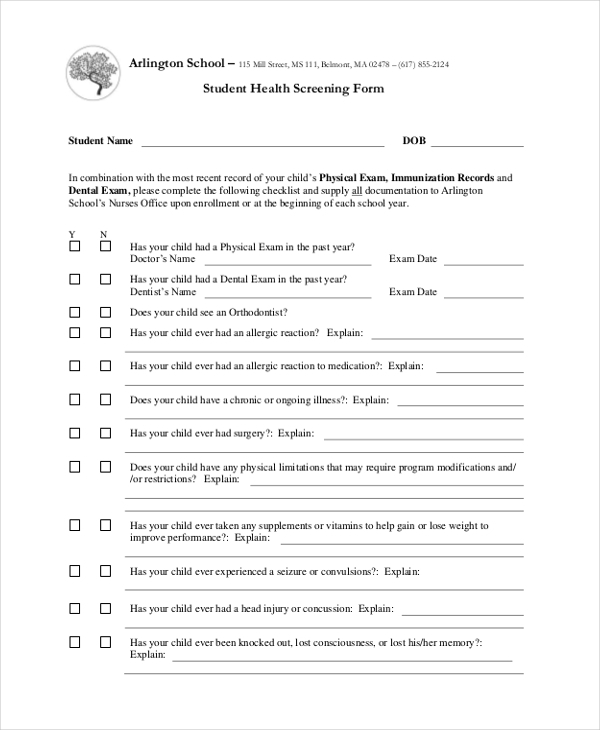 This health screening form for students comes in a PDF format and is ready for print. Plus, the template is well designed and comes with a neat layout as well. It is 100 % customizable. This health screening form has been devised for physicians, doctors and health organisations dealing exclusively in oral care. 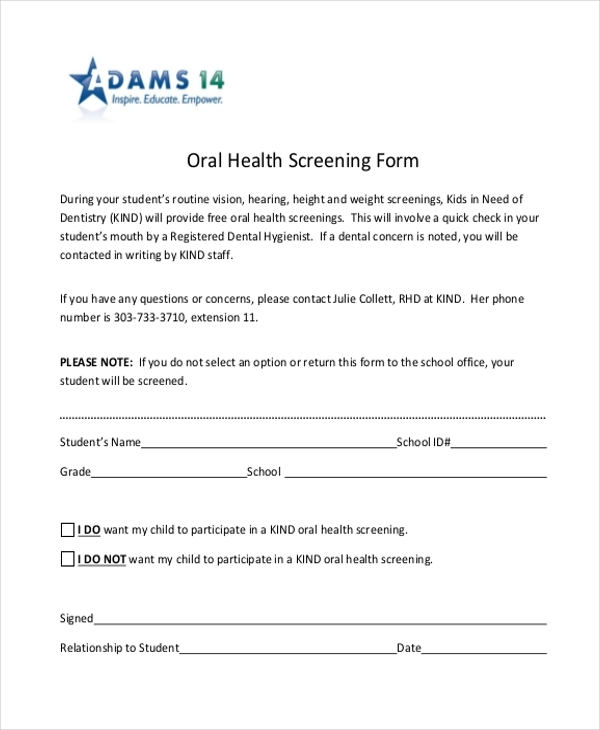 This is your best shot if you want to create an oral health screening form. 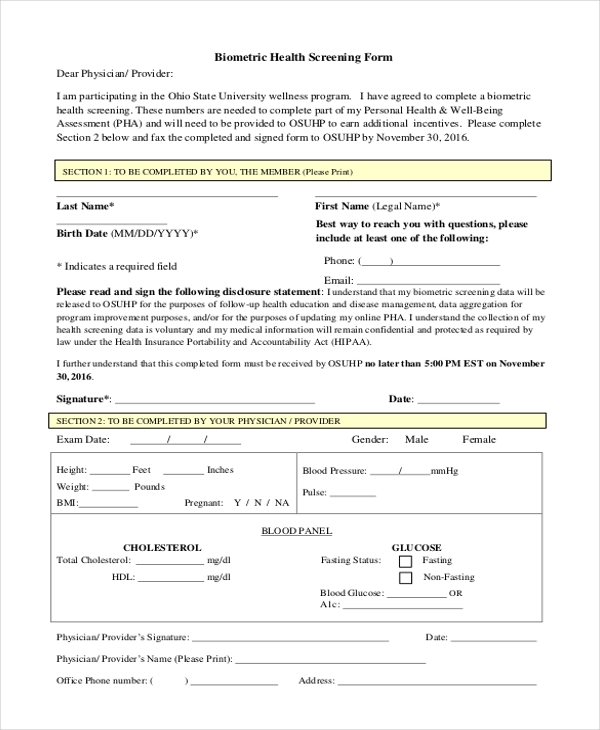 Who Can Use the Health Screening Forms? The health screening forms that you see here are limited to medical use only and may only be used for official purposes. Yet, these forms are pretty versatile in nature, owing to their different types. The health screening forms are mainly used by doctors and other medical practitioners. They contain details about a particular patient and are used to keep a tab on the patient’s progress. In other words, if we take into consideration a patient who is staying at a hospital, then the medical screening form would be a record of his or her stay. This is how medical screening forms come in handy. You may also see Health Insurance Forms. How to Use the Health Screening Forms? Most of the health screening forms that you find in this section either come in a word or PDF format. Both formats are pretty familiar to most of you and thus, you shouldn’t face difficulties using them. However, you must ensure that you take into account your purpose before you download the form template. Why do you need the medical screening form? Is it for a specific cause or for general use? Based on that, you should proceed with the downloading of the form template. Once you do, you are free to edit the details and tweak them to your advantage. You can also see Health History Forms. The health screening form templates would make your job ten times easier. You now wouldn’t have to worry about the format since it will already be provided to you. You can just go through the form that has been given and work accordingly. 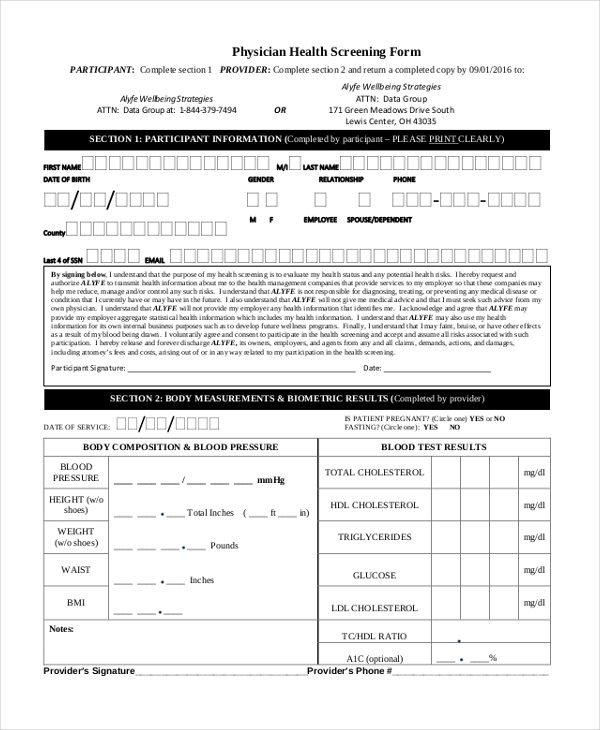 The health screening form templates are 100 % editable and customizable. Each kind of health screening form comes with its own set of requirements. 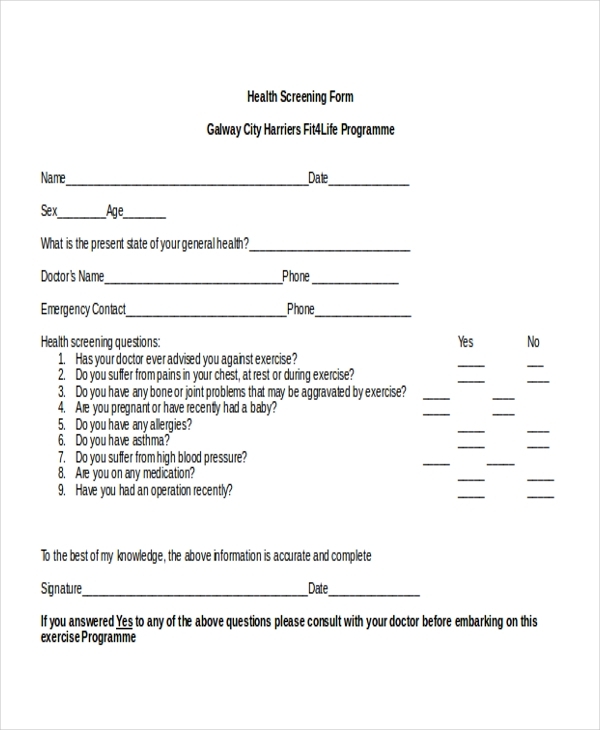 The health screening form templates here have been designed accordingly. The health screening form templates here would come in handy irrespective of whether you run a medical organisation or you are a doctor. You would still be able to download the template and make use of it. The best part about the templates here is that they are exceptionally easy to use, edit, save and print as well.